We provide our advertisers with custom programs to deliver verified calls. Our advertisers only pay for the leads and calls we bring them. 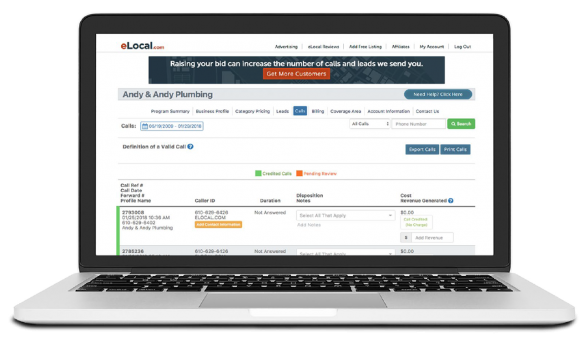 eLocal is a pay per lead marketing company that utilizes its proprietary monetization engine that delivers inbound calls to our advertisers on a fully customizable platform. Our telephony platform intelligently routes verified calls to our advertisers in real-time. We generate thousands of calls via Search, Social Media, SMS, Display, and Mobile Advertising that are verified for type of request and location through our Call Center or IVR. With a collective of 100+ years of marketing experience, the eLocal management team is focused on delivering continuous quality phone calls to our advertisers. "eLocal is one of our best performing campaigns!" "The pricing is great and their return policy is the best I've encountered, so the risk is greatly minimized. We'll be partnering with them for the foreseeable future.."
"eLocal is money well spent ..."
"I'm getting good, quality leads for people who need the services I provide. I'd definitely recommend it - just not to my competitors." "I've been with eLocal for almost three years now ..."
"I feel confident in both the quality of their leads and the level of professionalism they bring to the industry. They have their system running like a well-oiled machine and any time I need anything, their response is near instantaneous. eLocal is a great way to add to your online and lead generation efforts." "I've practiced law for nearly 30 years, "
"So I've tried just about every kind of marketing there is for the legal profession. I run a small law firm, so I had a great deal of skepticism and trepidation about trying eLocal, but I've been incredibly surprised and pleased by both the quantity and quality of leads. Without hesitation, I can recommend eLocal to any profession or business." Still Have Questions? Want to Get Started?